Are you a lifelong pontoon boat owner? A first-time owner? Perhaps you’re just starting to consider purchasing your first pontoon. Regardless of where you are in your pontoon-boating journey, there is one thing that all pontoon boat owners must know: how to keep your boat clean and well-maintained so that your investment lasts for many years. Taking proper care of your pontoon is more than just keeping it shiny and clean on the outside, in fact, it’s what’s happening on the inside that should be your main focus. Your engine is the heart of your watercraft and if cared for properly, will take care of you and your family’s adventures for decades. Engine care begins with changing the fuel filter at the start of each season. Early summer is the most common time for pontoon boat owners to perform routine maintenance or realize that there is a problem that needs to be addressed. Check spark plugs, fuel and fluid levels, and look for signs of rust or wear on components. And of course, be sure to keep up with all of the recommended maintenance per the engine manufacturer. Along with your engine, your battery should be inspected regularly to ensure that it is in proper working order. If you are unsure what to look for, bring your battery to a local marina before each season. They will be able to test it for you, make recommendations, or assist in getting a new battery if needed. Performing a summer safety check is not only recommended, it’s essential for every boat owner to ensure that their watercraft is ready to transport people safely. Responsible boat owners will take the time to inspect the exterior for holes, cracks, punctures, or corrosion that needs immediate attention. From there, check for signs of pests or other undesirable life in the boat; this could include rodents that may have wintered inside the boat, invasive species of plants that are attached, or mold and mildew that may have grown on fabrics during storage. Before putting your boat away for the winter, it’s important to take the time to ensure that it is ready for months of cold temps by cleaning it and taking steps to protect your boat from the elements. When washing your Bennington Pontoon Boat, whether prior to storage or anytime during the season, using a cleaning product that is specifically made for aluminum will bring out the brilliance and shine of your boat better than soap and water. Adding an extra layer of protection with a coat of wax is the best way to maintain and enhance your boat’s exterior. After cleaning the boat inside and out, use a boat cover or have your pontoon shrink wrapped to prevent water and debris from falling into the boat. Store your boat safely away from objects that could cause damage such as trees that may fall during the snowy season, or areas that may flood in southern regions. With a little time at the start and end of each season, a pontoon boat owner can significantly extend the life and safety of their boat. Bennington Pontoon Boats has been crafting the industry’s leading high-performance, luxury pontoon boats since 1997. 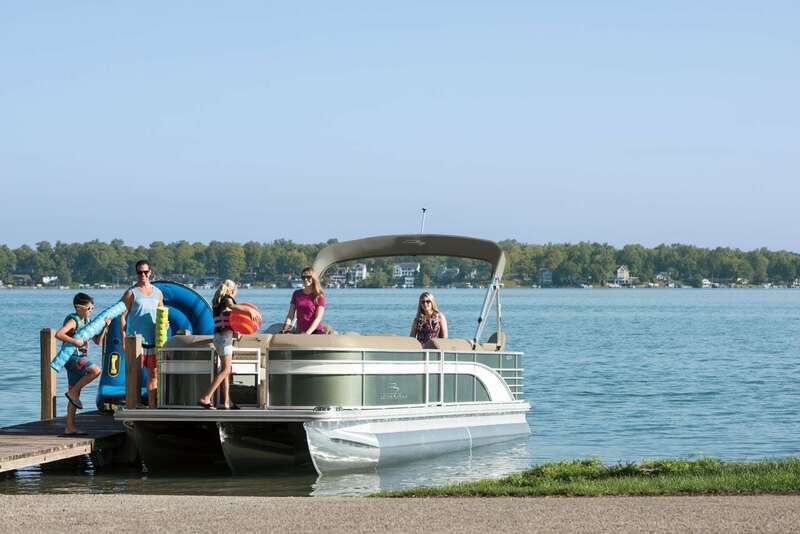 Find your next Bennington Pontoon Boat at a dealer near you.